Founded in London back in 1971, Costa Coffee has grown to become one of the UK’s best-known coffee shops, and today has branches in 31 countries. 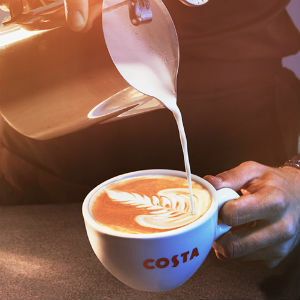 Costa’s passion for the art of good coffee and a pride in the artisan techniques of its baristas have made it the ideal go-to for perfectly prepared coffees and other hot drinks, whether you’re a lover of lattes or crazy for cappuccino. The Costa store at Princesshay serves a wide range of coffees, as well as lunches, cakes and snacks, making it the perfect place to visit whether you’re seeking a caffeine boost, a bite with friends or a buzzing place to catch up on some work. For a full list of all the food & drink retailers at Princesshay click here.